It's finally here after High Demand : Colloidal Magnesium 200ppm High Voltage Method to ensure the finest particle size never offered before to the public ! Are you tired of trying to find the Perfect Magnesium Product. Most don't even absorb 50% into the body, others only absorb 20% into the body, Oils itch the skin and do not even fully absorb. There are so many Magnesium types such as the toxic magnesium aspartate, and glutamate both made from Aspartame that causes the body many issues and diseases, then you have Magnesium Oxide and Magnesium Sulfate which absorb poorly and are unsafe. Finally they made "better Magnesium's" such as Citrate, Malate, Taurate, Glycante and Chloride however they Still do not absorb 100%, They usually come in large Pill/Tablet form, and they are ALL NOT PURE MAGNESIUM .....ALL are simply inferior to Magnesium Professional. Magnesium Professional 200ppm Colloidal Formula supplies you with 99.999% Pure Magnesium in Double Distilled Water at a strength of 200ppm. Each Batch of Magnesium Professional takes 72hours to complete from Start to Finish and you end up with a Perfect Magnesium Product with No Additives, No Fillers, No Preservatives, No Salts, No Chemicals, No Sweeteners, No Pills, No Tablets, No Capsules, No GMO, No Radiation, just simply Pure Magnesium at a Very High Strength. How Do you take Magnesium Professional ? Simple just take the Dropper of Scoop Provided at pour Magnesium Professional in to the Scoop, either 1 Tablespoon (high dose for Obtuse issues) or 1 Teaspoon (Regular dose still around 500x an Americans Daily Dose) and put this liquid in your mouth and under your tongue for 30seconds. 30 Seconds ensures the Magnesium Pro has Fully entered your Bloodstream and bypassed your Stomach Acid/ Intestines Fully ....AMAZING !!! 100% of the Magnesium Pro will enter your body and 100% of the Magnesium Pro will enter your bloodstream and will get to Work right away. Let them ALL TALK about this type or that type of Magnesium, NONE can compare to Magnesium Professional. Available in 2oz, 4oz, 8oz, 16oz, and 32oz sizes. The 2oz Size will come with a Dropper and all other sizes will come with a Scoop for easy use. 2oz Magnesium Professional : Will last 4 Doses (4 Days) at 1 Tablespoon or 12 Doses (12days) at 1 Teaspoon. 4oz Magnesium Professional : Will last 8 Doses (8 Days) at 1 Tablespoon or 24 Doses (24days) at 1 Teaspoon. 8oz Magnesium Professional : Will last 16 Doses (16 Days) at 1 Tablespoon or 48 Doses (48days) at 1 Teaspoon. 16oz Magnesium Professional: Will last 32 Doses (32 Days) at 1 Tablespoon or 96 Doses (96days) at 1 Teaspoon. 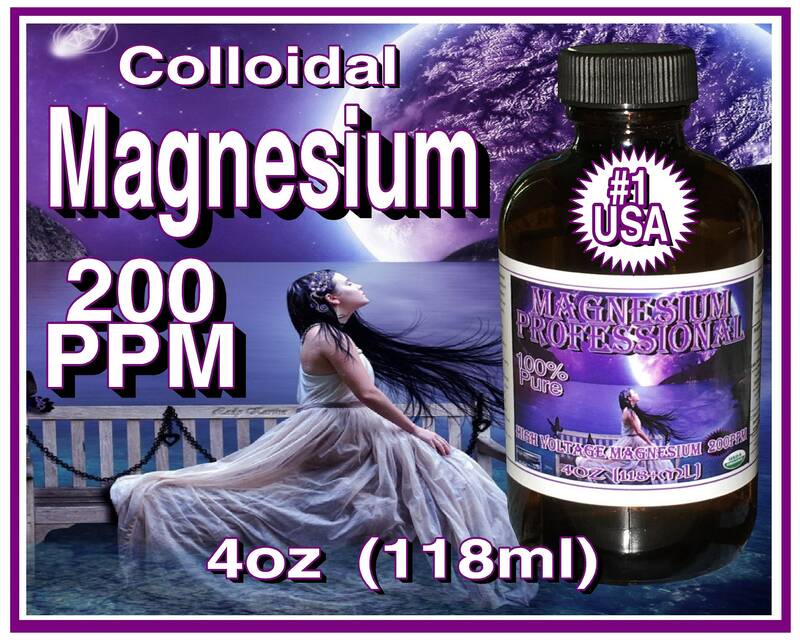 32oz Magnesium Professional: Will last 64 Doses (64 Days) at 1 Tablespoon or 192 Doses (192days) at 1 Teaspoon. STOP Wasting your Money, Buy Professional, Buy The Pure REAL Magnesium Professional 200ppm.